This entry was posted in coe and tagged Women's mobilization in Europe. 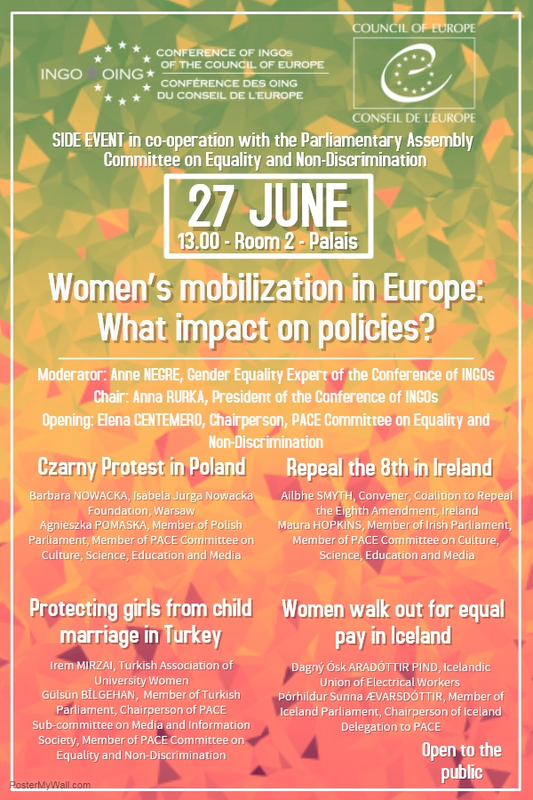 The Gender Equality Commission of the Council of Europe and the Estonian Authorities this country chairs actually the CoE, have organized in Tallinn a conference at the end of June: “Are we there yet? Assessing progress, inspiring action: the Council of Europe Gender Equality, Strategy 2014-2017“. 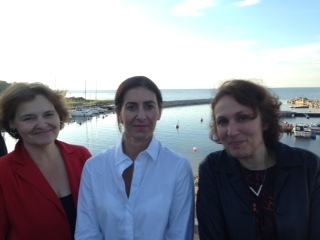 The programme was interesting, you can find it here: Programme Tallinn . You can have further informations about the event here: http://www.coe.int/en/web/genderequality/tallinn-conference . This entry was posted in coe and tagged Anne Negre, gender equality, Tallinn Conference, The Council of Europe. 21 and 22 June 2016, Council of Europe. With the group of work on religions of the Commission of human rights of the Conference of INGOs, we organized an event on the subject ” ARE RELIGIONS A PLACE OF EMANCIPATION FOR WOMEN? PROGRESS AND SETBACKS” Anne Negre the Gender Expert of The INGO Conference of the Council of Europe organized the event together with lots of other groups. It was a big success. The European Convention on Human Rights or the Lisbon Treaty for member States of the European Union respect religions or spiritual movements. National laws also protect freedom of conscience and worship for nationals of States countries of the Council of Europe while ensuring equality between women and men. We question the fate of this equality among places of worship. We have sent a questionnaire and we received around 1000 answers. Specialists are working on it, but we can say that if equality between women and men, was really respected, with no discrimination, people could accept to practise again. A very important number of people was there from the different pilars of the Council of Europe. The panelists were at the highest level and each representative of religions affirmed that there was no obstacle from theology. Elena Centemero, Italian Parliamentarian, Chairperson of the Committee on Equality and Non-Discrimination of the Parliamentary Assembly of the Council of Europe opened the debates, and, Gulsun Bilgehan, Turkish parliamentarian, Former Chairperson of the Committee on Equality and Non-Discrimination, Chairperson of the Media and Information Society sub‑committee of the Parliamentary Assembly of the Council of Europe, closed them. 22 june 2016, at the same place, Council of Europe, it was the time for discussions, and a lot of speakers and participants came back. It was productive and show a real interest for these questions. We have registered the debates of the 2 days,. Anybody who will be able to assist preparing the notes into a proper paper: please contact Anne via Boarduwe@gmail.com! This entry was posted in coe, Uncategorized. This session was particularly important as elections for the new standing comittee were due to take place on the 29 th (election of a president, vice presidents and rapporteurs). Besides that there was also the election of a gender expert as the term of Betty Doornendal ended in 2015. Anna Rurka was elected président and three vice présidents two women Antonina DASHKINA (a social worker) Laura FRATTI GUCCI ( an economist) and Israel MENSAH ( a prominent educationist) a very good team to lead the new Standing Committee. 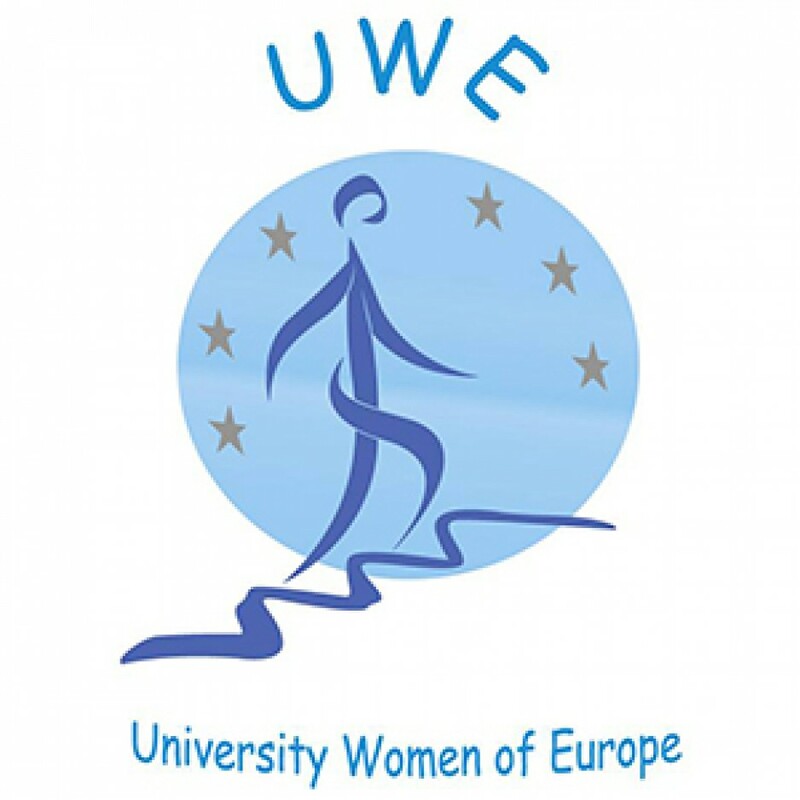 Regarding the post of the gender expert three persons were candidates but one had to withdraw because of health problems and from the two remaining Anne NEGRE introduced by UWE and Rosy WEISS introduced by IAW , Anne NEGRE was elected . The expert has a seat at the standing Committee to present ( and defend) gender issues as a cross cutting issue. On Monday 26th The standing committee of the Conférence and its Bureau met in the morning and some working groups met in the afternoon. A s a consequence a resolution was presented to the Parliamentary Assembly by the Conference of INGOs after a vote in plenary session the following Thursday. The Commissions on Human Rights met in the afternoon. Commission on Education and Culture had a fascinating intervention of two specialists of the new technologies with discusssion from the floor . The main event was the meeting of the Conference of INGOs all day the 29th with a heavy agenda that included procedures for the elections, different reports as well as two important hearings. One on Strategic priorities for the promotion of civil society to the decisions process in UKRAINE. The second an exchange and discussion with a delegation from Morocco as part of the proceses of cooperation of CoE , Lisbon Center and the countries of the Mediterranean area. NB : The Council of Europe House of Demoracy is an Inter parliamentary European institution and gender equality is recognized as a value for democracy . However it is not a specific program as such . At the time of restructuration the Commission on Equality for women and men was suppressed. We must give credit to our friend Anje Wiersinga from IAW who established an informal group , mobilized the women INGOs to obtain a post of gender expert ,is keeping watch on the parliamentary Commissions to remind them of the gender issues The gender expert should closely cooperate with this existing women’s group that is meeting ay every sessions of the INGO Conference. This entry was posted in coe and tagged Council of Europe.